Select from our extensive library or original art or send us your own art for customized ceramic mugs. Name Dropping available on all mugs. 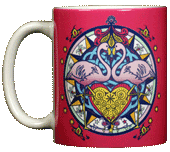 Check out our Wild Cotton® Stock Mug Designs! 244 items found in this category.